Dorothy Shamonsky, Ph.D, is Director of UX R&D at Boston UX, Waltham MA, where she works on innovation of natural user expereinces for embedded and Internet of Thing devices. 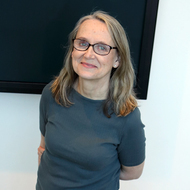 Prior to teaching at Brandeis, she taught at Tisch School, New York University and in the Computer Graphics Department, Pratt Institute. She received a MS.Vis. and Ph.D. from the Media Lab, Massachusetts Institute of Technology and a B.F.A. from Rhode Island School of Design.